A Versatile, Roomy and Affordable Storage Solution. Year-round holds all your garden tools and larger backyard items like fertilizer, planters, and a trimmer or push mower. In the fall/winter, use it for backyard clean-up storage, rock salt, or snow shovels. 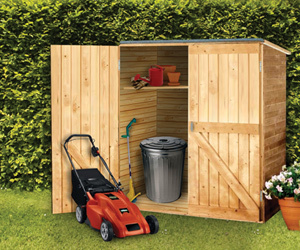 Also offers ample storage capacity for trashcans and recyclables. Constructed of durable and treated pine to withstand adverse weather. Secure rust-resistant zinc-plated door closure to keep your gear safe and secure. Extra-high front doors allow for easy entry and access. Sloped tar roof is leak-proof, and allows rain and snow to drip away from the front doors. 2 interior corner shelves house your smaller items. Can be stained or treated to add extra life or a splash of color to your property. Detailed assembly instructions included to make the task relatively easy. 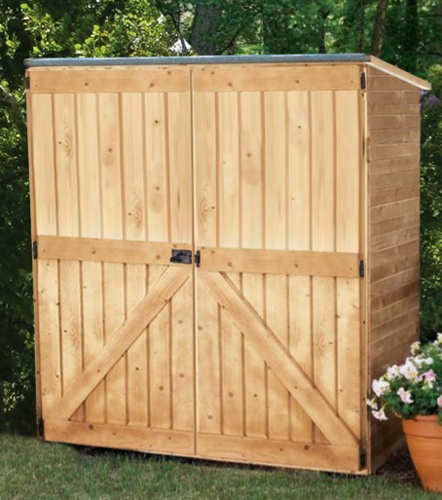 Download the Outdoor Wood Storage Shed sales sheet.